Unless someone lives in your shoes it is hard for them to understand what hypothyroidism does to you. I have no doubt there are many people in your life that don’t get your experience with hypothyroidism. Perhaps sharing this article will help them understand your experience a little better. Following my wife’s work as an active patients’ advocate, meeting thousands of patients and their relatives at her lectures and other engagements, I can’t help but notice the similarity in people’s stories. However, one thing has struck me the most: so many are struggling with various issues in their daily lives – especially in their family life and work. At the lectures, many people – mostly husbands – have asked me how our marriage has survived this far, how it was like for me to live with a woman suffering from hypothyroidism, and how they can support their wives. For many patients, hypothyroidism can be a cruel illness to live with, especially with all its horrible symptoms. However, if you add divorce and/or maybe job loss to that, it makes it even worse – I have met a lot of people in that situation. And there is no doubt that hypothyroidism can be hard on a marriage. As a husband, you will probably hear about this illness a lot because it affects all aspects of your life and that of your wife. Besides, you might already be a little tired of listening to her complaints, not to mention that it might not always be interesting talking about the disease. But don’t give up just yet, as there is hope if and when she gets the right treatment. Let me describe some of my experiences in living with an undiagnosed, later undertreated, and finally well-treated thyroid patient. 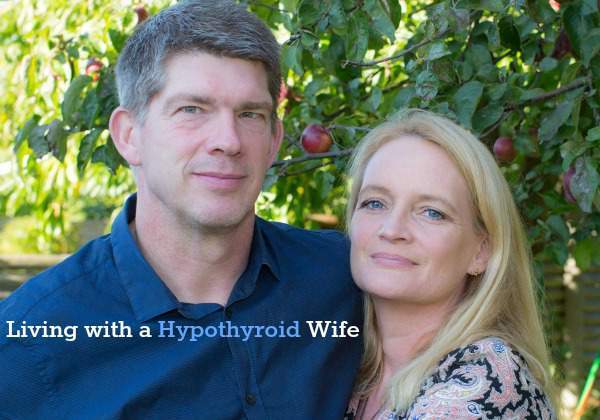 First of all, I now realize that my wife had already the symptoms of hypothyroidism from the time we first met. She was always feeling freezing, always needing an extra blanket or a thick down jacket even in summertime. That was how I met her – she needed my warmth. As years went by, more and more symptoms became known. Not only did she gain weight, she was also sleeping a lot. She suffered from preeclampsia when she gave birth to our boys. But at the time, I didn’t know that Helle was actually ill – I just thought it was all part and parcel of getting older. But Helle herself was convinced that something was wrong with her. Finally, she was diagnosed with hypothyroidism and was told that she needed medicine for the rest of her life, but that she would feel well again, and that her symptoms would eventually disappear. Sadly they did not. Don’t think for a moment that I was actually much of a support at the beginning, even though Helle was by then already diagnosed. Sure, I knew she was sick. But I also knew that she was on medication, so she should be alright, and so I thought! I was too busy and caught up with trying to manage both my job and almost all the housework at home like doing the dishes, preparing dinner, doing the laundry, cleaning, picking up the kids from kindergarten and school, and fixing the old house we had bought – all at the same time. I was too busy to really be conscious of my wife’s illness. Of course, when I had the time I sometimes wondered why my wife was always sleeping when she came home from work. Sometimes she would sleep until the next day when she had to go to work again. I wondered why she suddenly seemed to have problems with her employer – she used to be a highly valued employee who was entrusted with a lot of responsibility. She used to argue even with the Boss when he tried to interfere with her work – and more often than not she’d get her way. But suddenly, all her spirit was gone. I used to wonder why she kept forgetting everything – all the time: purse, credit card, cell phone, shopping list, where she was, and where she was going. Time and time again I would get phone calls from nice people who had found her credit card or purse. She had to have a new credit card – (and all the other cards) all the time – including new codes, that she could never remember. And new phones – we’ve spent a fortune on cellphones. Sometimes my wife would call me from some place where she had ended up while driving home, having forgotten where she was. Or, she would tell me that she was late because she had to pull over and take a nap. She also gained even more weight – a lot of weight, even though she was always following a serious diet. I couldn’t understand why. However, I did not really think much of it. After all, she had given birth to my two beautiful sons. Maybe it was only natural. It didn’t matter to me – for I love my wife. In all this, she saw her doctor quite often and later some endocrinologist – I honestly don’t remember the details. She would often complain to me about her weight gain and about her troubles with getting back in shape. She could hardly walk, even up short stairs, without taking a break to breathe. I listened but I didn’t really quite understand. And of course sometimes I got a little tired of talking about the disease. I just hoped the doctors would help her. However, they did not. And life went on – daily life that is. One day she told me she had found a new doctor (again! ), and that she wanted to give it another try. He apparently gave her another kind of medicine – I didn’t really understand at the time the difference. I was busy. But something happened. My wife changed, not instantaneously but gradually. Her mood changed. She was happier, and her spirit returned, slowly but surely. She then lost weight – a lot of weight. After two years of adjusting her medication, she completely looked and behaved herself once again – beautiful and full of energy. It was when I read the manuscript of her new book that I finally realized what she had been going through, and how ill she had been. I also came to realize how terrible she had been treated by her doctors, and how little people including me and many a doctor had understood hypothyroidism. The book finally helped me accept and understand my wife’s illness and to realize how I could support her. After Helle finally got the proper treatment, I really don’t think much anymore of her illness. She is again the person that I married 17 years ago. But Helle still needs help and support. Hypothyroidism is chronic and if she forgets her medication, even for only a few days, the symptoms would be back. She has to take her pills three times a day. In the beginning Helle hated when I looked inside her pill-box and told her if she had forgotten to take some of the pills. But she learned to accept it – because if she forgets her pills – the symptoms come back and she becomes forgetful and therefore forgets to take even more pills. So I have become her memory. Every morning I give her the first pills and check that she remembers all the pills on the day before. As long as Helle takes her medication, hypothyroidism does not affect our life anymore. How can you help your hypothyroid wife (or husband, girlfriend, boyfriend, relative)? That really depends on whether s/he is well treated or still struggling just to get diagnosed or find the right dose or treatment. Most importantly: remember that you love each other. Remember how you first fell in love. Help each other to recall those precious moments. You will need those to get through the difficult times ahead. Accept and understand her/his situation. It might be helpful to read about other patients’ experiences. You will realize that other patients are in the same situation and that there is hope for a normal life again. Don’t expect too much from her/him in daily life. You probably have to take up most of the practical work in and around the house. Don’t let her see the doctor alone. A person suffering from hypothyroidism will often find it difficult to explain her symptoms. Be there to support her and if necessary be her advocate. Help her get the proper treatment. And if need be, help her find another doctor. Read books about hypothyroidism – because she probably can’t concentrate or remember what she reads. Remember, there is always hope. Given the right treatment, chances are your wife will recover and be herself again. Maybe she needs help with the medication. Doses sometimes have to be regulated and adjusted. Be aware of your wife’s condition – has she changed? You will probably be the first to notice. Is she getting tired and forgetful again? Maybe she needs a raise in dose – talk to the doctor. Or is she restless and anxious? Maybe the dose is too high – talk to the doctor. When your wife is well treated, she probably will not need that much support anymore on account of her illness, except for making sure that she does take her medication which you might need to remind her. Also, she might need your help to explain her illness to other people. Hypothyroidism is a trivialized illness and very few know anything about the consequences and extent of the disease. Accept that hypothyroidism will be part of your lives. But manage it right, and hypothyroidism will have little or no impact on the way you live your life. My wife Helle was sick with hypothyroidism for years. When she was finally diagnosed, she was treated with a T4-only medication known as Eltroxin. The symptoms did not go away – they got worse. 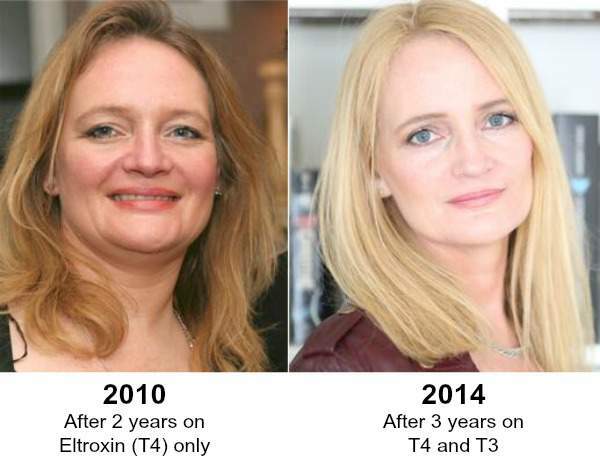 It wasn’t until she got a new doctor who added Liothyronine (T3) to her treatment regimen that she felt well again. Read her story in From Hypothyroid to Healthy. My sister has just received test levels back and it says her TSH level is high. If she has hypothyroidism, it would explain a lot of the symptoms you are all describing, but she has also been like for years. According to this article I came across though it says you can’t simply rely on the tests. Does anyone have experience with this? I was diagnosed with Hypothyroidism 6 years ago. Upon diagnoses, my practitioner admitted that I had likely suffered from this condition for years as I had experienced 4 miscarriages among many other symptoms. At the beginning of this year, I found a wonderful practitioner who addresses thyroid conditions with a Functional Medicine approach. This has been a total tame changer for me! I am no longer a T4 only patient. She has been able to add other medications that are helping to get my condition and symptoms under better control. She diagnosed me with Hashimotos, which is a very common cause of hypothyroidism, but no other practitioner had ever checked. When my first labs came back, my antibodies were literally off the charts. My thyroglobulin level, which should be less than 9, was reported as more than 900 (apparently they just quit counting at that number). Since starting treatment with her, this level has steadily dropped as have my symptoms. I am currently taking T4 as well as T3, and Low Dose Naltrexone to lower my antibodies. She explained that my TSH could look great, but my body is still struggling to convert, which is making me tired, depressed, etc… I would strongly encourage anyone out there experiencing hypothyroid symptoms to seek out a practitioner that is willing to address your issues with more than T4 only treatment! My mother was diagnosed when i was about 12. Needless to say i have had a lot of time with this illness. My wife has hypothyroidism. We have been together for 8 years now. 5 almost 6 in marriage. This is by far the hardest thing i have ever done in my life. We’ve always had a family. There has been good and bad. Sometime i just need to talk to someone that might be going through the same thing. I imagine it is terribly difficult to watch loved ones struggle with thyroid disease. I am happy you are here at Hypothyroid Mom. I have been sick for about 3 years with a swollen lymph node that no one can figure out why. I have been to over 5 different doctors . I just went to one doctor who drew over 8 vials of blood to test for various things. My Thyroid came back & she said I had hypothyroidism she later drew blood & it looked fine. I am so confused & just want to feel better. I was just diagnosed and I pray I become normal again! I feel for you. I was just diagnosed as well after having my right thyroid and a nodule removed 6 months ago. You truly do feel like you’re going insane. Still trying to get regulated. Hope you feel better. I have hypothyroidism. When they ran a test on me 18 months ago, they found that my thyroid was ok, but some gland that helps your thyroid work properly was batting at 135 while supposed to be somewhere between 3 & 5. (I don’t know all the right terms). I didn’t even know I was sick. I thought I was tired. I was a single mom who worked 2-3 jobs all the time to pay bills. I can tell a difference since being on the medicine. I didn’t know I could have the energy I do. But I can also tell when I miss a dose. I just want to sleep, my brain is foggy and I hurt all over. I’ve been divorced for three years now, and it came about the last year my wife and I were together because it was only about halfway through the year that she was diagnosed. For several years she had all the classic symptoms, but of course could be explained away — and treated — by other factors, not knowing it was all mimicry or was actually being triggered by the hypo. She began on 60mg of Armour in June and all either of us knew was it was treatable, without realizing all the other symptoms she’d had could have been and likely were related. They were all mostly physical symptoms. By the time she was being treated, however, her mental state had begun to change and did so even more dramatically over the ensuing months. I found out much later, during the divorce, she should have returned to the doctor shortly after beginning Armour to have her TSH levels checked. So, she’d probably had thyroid problems for years, did not have an initial follow-up about her levels, all the while becoming more and more erratic to the point of becoming a danger to herself and me. Our relationship was ending as were several close friendships that had gone on for years, as well as some of her own family members. She had 4 jobs in two years and during our separation/divorce, 4 roommates in 1 year. She ran all of them off as her employers ran her off. During our separation period, she threatened suicide on at least three different occasions. The aggression on her part led to restraining orders and a domestic violence injunction — that she had placed on “ME.” It was so unpredictable that when we went to court I had a choice to leave the injunction in place and never see or talk to her again but able to plead ‘not guilty’ to alleged charges. And I had to do it. I lost my house temporarily after she abandoned it, my dogs, all belongings I brought into the marriage, and part of my sanity. She’d already started another relationship while we were together and I have no idea where she is now and have always hoped and prayed that she got the proper treatment for her sake and anyone with whom she has a relationship, be it boyfriend/husband, friend and employers. It is a very unforgiving and tragic disease that can change so much in so little time.